Dr. Zhang’s current research is focused on the molecular and genetic basis of pulmonary and vascular diseases including COPD, ILD, sleep apnea and sickle cell and systemic complications associated with these diseases. She is also actively working on the discovery and validation of prognostic and diagnostic biomarkers related to lung and vascular diseases. In addition, her laboratory is actively investigating the functional significance of disease associated genetic variants and their roles in disease pathogenesis. 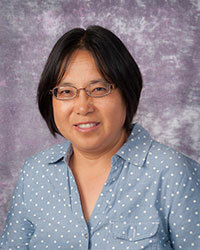 Dr. Zhang also directs the translational core lab for the Division of Pulmonary, Allergy and Critical Care Medicine and the Biobank for Cardiology and Vascular Medicine Institute. She has been PI or co-I on multiple grants funded by NIH and other agencies. She has published over 100 peer-reviewed manuscripts. Dr. Zhang is actively involved in the training of clinical and basic scientists. She co-directs and teaches a summer course that is designed to provide fundamentals of translational research for clinical fellows. The course includes both structured lectures as well as hands-on laboratory classes covering molecular and cellular biology, immunology, omics and other cutting-edge technologies important in translational research. She is also a faculty facilitator for the Evidence-Based Medicine class for medical students. During her tenure at the University of Pittsburgh, she has mentored 18 clinical fellows, clinicians and post-doctoral trainees for their translational research. Dr. Zhang is also the mentor or co-mentor for 12 undergraduate and 13 graduate/medical students on their molecular, genetic and translational research. Dr. Zhang has been invited to present more than 30 seminars and lectures on her research locally and at international institutes. Radder JE, Zhang Y, Gregory AD, Yu S, Kelly NJ, Leader JK, Kaminski N, Sciurba FC, Shapiro SD. Extreme Trait Whole Genome Sequencing Identifies PTPRO as a Novel Candidate Gene in Emphysema with Severe Airflow Obstruction. Am J Respir Crit Care Med. 2017; 196(2): 159-71. Zhang Y. MUC5B and short telomere length in hypersensitivity pneumonitis. Lancet Respir Med. 2017; 5(8): 603-4. Tan J, Tedrow JR, Dutta JA, Juan-Guardela B, Nouraie M, Chu Y, Trejo Bittar H, Ramani K, Biswas PS, Veraldi KL, Kaminski N, Zhang Y, Kass DJ. Expression of RXFP1 is Decreased in Idiopathic Pulmonary Fibrosis: Implications for Relaxin-Based Therapies. Am J Respir Crit Care Med. 2016; 194(11): 1392-1402. Noth, I, Zhang, Y, Ma, S-F, Flores, C, Barber, M, Huang, Y, Broderick, SM, Wade, MS, Hysi, P, Sciurba, J, Richards, TJ, Juan-Guardela, BM, Vij, R, han, MK, Martinez, FJ, Kossen, K, Seiwert, SD, Christie, JD, Nicolae, D, ...et all. Genetic variants associated with idiopathic pulmonary fibrosis susceptibility and mortality: a genome-wide association study. LANCET Respiratory Medicine. 2013; Jun;1(4): 309-17. Peljto, AL, Zhang, Y, Fingerlin, TE, Ma, SF, Garcia, JG, Richards, TJ, Silveira, LJ, Lindell, KO, Steele, MP, Loyd, JE, Gibson, KF, Seibold, MA, Brown, KK, Talbert, JL, Markin, C, Kossen, K, Seiwert SD, Murphy, E, Noth, I, ...et all. Association Between the MUC5B Promoter Polymorphism and Survival in Patients With Idiopathic Pulmonary Fibrosis. JAMA. 2013; Jun 5;309(21): 2232-9. Yu, S, Yerges-Armstrong, LM, Chu, Y, Zmuda, JM, Zhang, Y. E2F1 Effects on Osteoblast Differentiation and Mineralization are Mediated through Up-regulation of Frizzled-1. Bone. 2013; Jun 24. Richards, T, Park, C, Chen, Y, Gibson, KF, Di, YP, Pardo, A, Watkins, SC, Choi, AMK, Selman, M, Pilewski, J, Kaminski, N, Zhang, Y. Allele Specific Transactivation of Matrix Metalloproteinase 7 by FOXA2 and Correlation with Plasma Levels in Idiopathic Pulmonary Fibrosis. AJP Lung. 2012; Jan 20 (Epub ahead of print). Richards, T, Kaminski, N, Baribaud, F, Flavin, S, Brodmerkel, C, Horowitz, D, Li, K, Choi, J, Vuga, L, Lindell, K, Klesen, M, Zhang, Y, Gibson, K. Peripheral blood proteins predict mortality in Idiopathic Pulmonary Fibrosis. Am J Respir Crit Care Med. 2012; Jan 1;185(1): 67-76. Zhang, Y, Noth, I, Garcia, JGN, Kaminski, N. A variant in the promoter of MUC5B and idiopathic pulmonary fibrosis. N Engl J Med. 2011; 364: 1576-7. Zhang, Y, Handley, D, Kaplan, T, Yu, H, Bais, AS, Richards, T, Pandit, KV, Zeng, Q, Benos, PV, Friedman, N, Eickelberg, O, Kaminski, N. High throughput determination of TGFß1/SMAD3 target in A549 lung epithelial cells. PLoS One. 2011; 6(5): e20319. Funding Agency: United Therapeutics Corp.